Sonic is so much like the modern zombie I’d be willing to bet that 28 Days Later started life as a documentary about life on Mobius before funding was cut over sadly inevitable creative differences. He’s faster than he should be, always thinking about his next meal – if the fantastic Sonic novels I read as a kid are anything to go by, anyway – and continuously comes back from the dead. The blue ‘n’ spiky one’s time has come and gone multiple times but he persists, propelled only by the power of nostalgic wallets, foolish children and passionate fans. Now he’s arrived on PC after a bit of a hiatus from the mother-platform with 2013’s WiiU/3DS exclusive Sonic Lost World. Gotta go fast? Here’s the best racing games on PC. In Lost World, that old villain Eggman has created six monsters and then idiotically lost control of them. He asks for and for some reason receives Sonic’s help in defeating them, rather than the hedgehog laughing in his face and spinning dust at him until he went away. Sonic himself is upgraded with “new parkour moves” and “improved Colour Powers” but none of it will bring Iggy The Mouse from Sonic And The Silicon Warriors back, will it? The title reviewed averagedly on console, scorings 4s and 6s from most of the major sites I saw on a quick Metacritic visit. Opinion, as it so often seems to be, was split though and some rated it a 9. I’ll be honest, even the greatest Sonic games of his past, the ones where you could even play the far cooler Knuckles and I sunk 20 hours into because I had nothing else to play – they would not get 9s from me. They’d be lucky to push the high 7s, if I’m honest. But! Positives: the PC version is shipping to Steam with the Nightmare DLC included, which is an excellent name for Sonic DLC. Plus, it’s regarded a hell of a lot better than the more recent Sonic Boom. It promises full support for all our various peripherals and should run at a smooth 60 FPS. 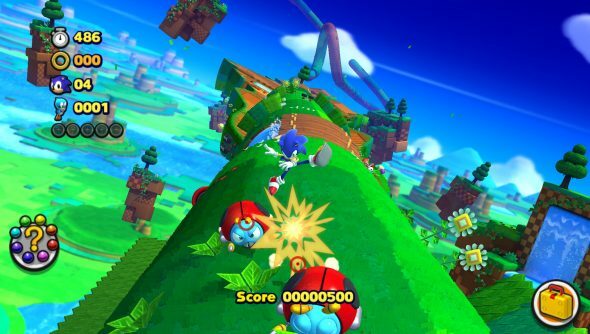 On that last point, while I’ve been unimpressed with 3D Sonic’s third-person maneuvers since forever, it is a style of game that will look just lovely at that framerate. It’s also out soon on November 2nd for£19.99/$24.99/€22.99 and includes the apparently-great Sonic & All-Stars Racing Transformed as a pre-order bonus, which was not only a surprise karting masterpiece but isreally quite fun to say.